RAE Systems Inc., the leader in wirelessly connected gas and radiation detection solutions, today introduced ConneXt Pack-Confined Space, the industry's first wireless, portable, confined space gas detection system that significantly enhances worker safety in industrial environments. ConneXt Pack-Confined Space is a turn-key, application-focused combination of wireless four-gas QRAE 3 monitors and an EchoView Host portable controller. ConneXt Pack-Confined Space provides plant safety managers, contractors and utility/telecommunications organizations with portable real-time confined space wireless gas detection wherever they need it. ConneXt Pack-Confined Space is the first confined space wireless gas detection solution that provides real-time man-down alarms and can alert attendants and workers about toxic gas and contaminants and help provide faster response time. ConneXt Pack-Confined Space is pre-configured for easy deployment, and its automatic data logging facilitates compliance reporting. The ConneXt solution delivers lifesaving value to confined space operations. Data retrieved from wireless gas monitors can alert attendants instantly of toxic gas situations. For example, when the wireless system delivers immediate hazard information on whether people have been exposed to toxic or flammable gases, safety managers can take timely action, such as determining whether to organize a rescue, what safety gear needs to be worn, and whether the individual is in a conscious state. The system can be deployed rapidly, and is ideal for confined space entry, contractors with mobile workforces, and as an entry-level gas detection solution for routine maintenance or compliance monitoring. 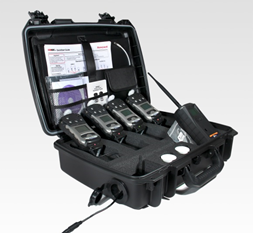 The ConneXt Pack-Confined Space solution consists of up to four of RAE Systems' new QRAE 3 4-gas monitors and an EchoView Host portable controller. The QRAE 3 is versatile, rugged, one- to four-sensor gas monitor that provides continuous exposure monitoring of oxygen (O2), combustibles, and toxic gases, including hydrogen sulfide (H2S) and carbon monoxide (CO).The QRAE 3's wireless communication capability enables access to real-time, remote instrument readings and alarm status – including an innovative man-down alarm – from any location, for better visibility and faster response. The EchoView Host functions as the center for a mobile wireless network to increase awareness and improve decision-making, resulting in faster incident response. The EchoView Host can receive communications from up to eight monitors and display their call names, readings, and alarm status in real time on an easy-to-read screen. With a communication range extendable to more than one kilometer using Mesh Routers, the EchoView Host gives safety officers remote access to gas concentration data directly from the hot zone. Waterproof, dust-tight, and intrinsically safe for Class I, Division 1 hazardous environments, the rugged device can run up to 10 days on a single battery. ConneXt Pack-Confined Space is part of the Honeywell ConneXt Safety Solution – the world's first wireless, plant-wide gas detection safety system. The ConneXt plant-wide gas detection safety system provides plant managers with real-time information as well as 24/7 detection and location data from personal, portable or area monitors. The data can be viewed locally or at a centralized station, where the information can be used to regulate or verify process controls, elevate worker safety and protection, improve asset and risk management, and meet regulatory compliance requirements. ConneXt Pack, the industry's first and only turn-key wireless monitoring system for routine maintenance and confined space entry. ConneXt Plus, a real-time, easily deployable wireless safety system that can be used for plant turnaround, overhaul, incident response and mobile wireless gas detection. ConneXt Pro, a full enterprise solution that delivers the highest level of real-time intelligence in the harshest work environments. ConneXt Pro is the solution that provides year-round 24/7 coverage. Once installed, ConneXt Pro can be easily duplicated across many plants.